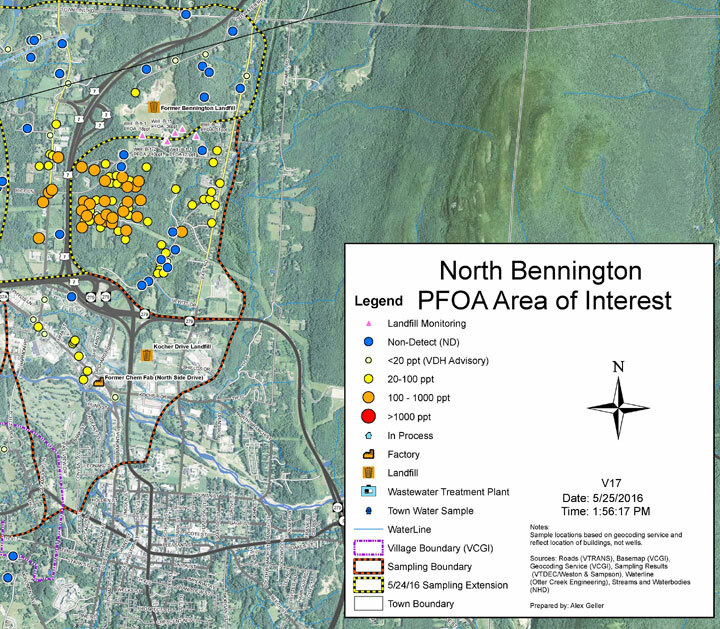 WHEM has a contract with the Vermont Department of Environmental Conservation (VT DEC) to conduct water quality testing at over 100 homes in Bennington that have drinking water wells contaminated by Perfluoroalkyl Substances (PFAS) from historical widespread releases by the former ChemFab factory. Point-of-Entry Treatment (POET) systems have been installed in most of the homes. WHEM collects water samples from these treatment systems, including the raw (untreated) water, and submits the samples for laboratory analysis of 12 PFAS compounds (EPA Method 537.1 modified). Our primary objective is to confirm that treatment systems are working effectively to remove the PFAS from each home’s water system. We also utilize the data to evaluate fluctuations in PFAS concentrations in the raw water over time. WHEM follows a strict PFAS sampling protocol to ensure that quality assurance and quality control needs are met. WHEM also manages all the laboratory data in a comprehensive database for the VT DEC.